Spring is a busy time on most farms. It’s crazy busy on mine. Shearing the llamas and alpacas, trying to get the garden in order and planted, and getting the barn ready for hot weather take a lot of time. Every year I say I’ll simplify or get a head start and every year things are still crazy. This year I managed to add another layer of crazy. I decided to get a few chicks to make my flock a little bigger. I thoroughly enjoy my chickens, I wanted more eggs, and more hens keep my rooster busier. So I picked up five chicks from our local feed store; 1 auracana, and 4 black jersey giants. Somewhere around 3 or 4 weeks I noticed that one of the JG hens had a bigger comb than the others. It was also much taller than the others. Two weeks later I saw wattles growing in. I couldn’t ignore it or pretend any more. She was a he. Which one is the rooster? Easy to see! This little rooster, now known as Ricardo Montalban, cannot live with my Swedish Flowers hens and rooster. For a whole variety of reasons, he and the 3 JG hens will have their own yarn and coop. And that’s where more of the crazy business comes in. 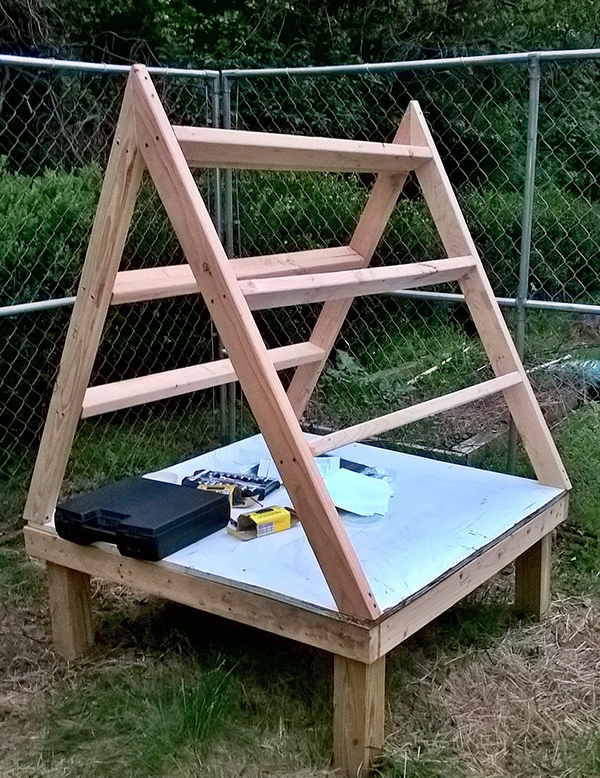 After extensive searching for another well made chicken coop and finding only very expensive or rather poorly made coops, I decided to build one myself. For as long as I can remember, I have wanted to learn how to build. 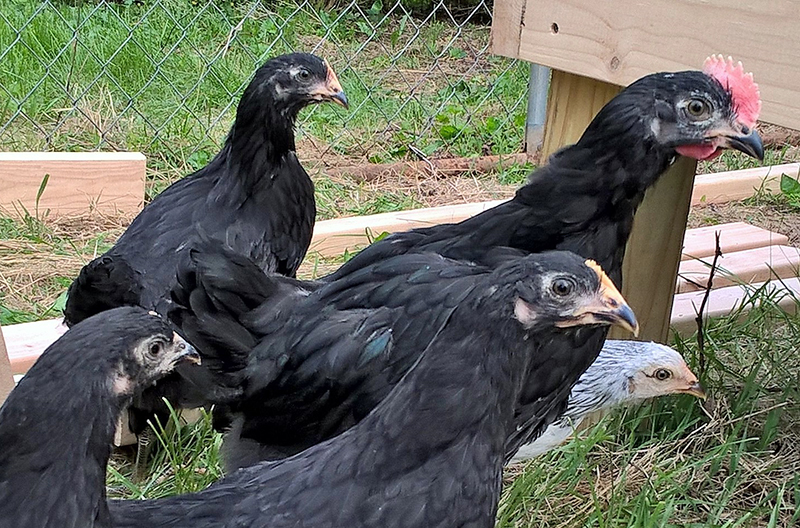 It’s easy to come up with reasons why I couldn’t build a coop but I was determined to ignore all of those reasons and give this a try. I looked at lots of on-line coop plans and couldn’t find any that I wanted to attempt. I finally settled on an easy design I found in a book, Reinventing the Chicken Coop, that I’d checked out of the library. I copied the plans for the A-Frame Coop and bought my supplies. Last weekend I finished cutting and assembling the frame.